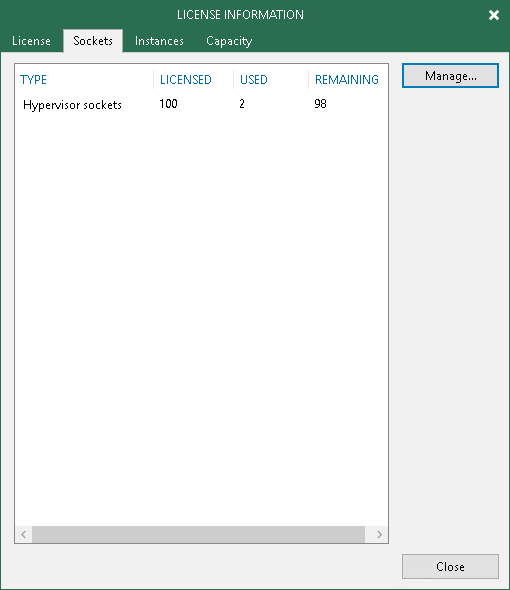 When you run a job, Veeam Backup & Replication applies a license to a protected workload (for per-instance licenses) or to the virtualization host on which processed VMs reside (for per-socket licenses). You can view to which objects the license is currently applied. For protected workloads, open the Instances tab and click Manage. The number of license instances that a protected workload consumes depends on the workload type and product edition. For example, 1 VM in the Enterprise Plus edition of Veeam Backup & Replication consumes 1 instance, whereas 1 workstation machine in the same product edition consumes 0.33 instances. For details, see Veeam Licensing Policy. For licensed hosts, open the Sockets tab and click Manage.